Who qualifies for a Tax Credit Scholarship? • A student who is coming to a private school after attending at least one year (two semesters) in an Indiana public school. If your family qualifies for assistance, but you do not apply when your child first enters school, you may lose the opportunity for a Voucher or Tax Credit Scholarship for the next 13 years. 1. To see how much tuition assistance you are eligible for, first register at your Catholic school of choice. 2. To apply for funding, visit www.i4qed.org/sgo. NOTE: a 90% voucher scholarship is the lesser of the tuition and fees charged by the Catholic school or up to $4,800 in grades K-8 and more for grades 9-12. A 50% voucher is half of a 90% voucher. 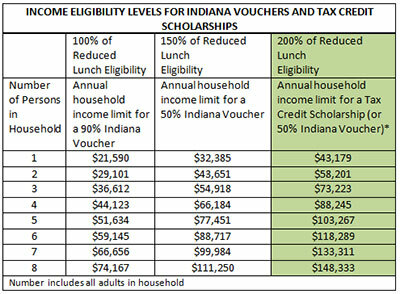 Income levels are determined in accordance with verification rules at www.doe.in.gov/choice. *A family at between 150 and 200% of Reduced Lunch Eligibility may be eligible for a 50% voucher if the student received a voucher for 2013-2014 OR if the student has a disability requiring special education.